From the original oil painting, in a private collection. Feel the warmth of the sun on your skin, hear the rustle of the leaves as Azalea Path beckons you to a springtime stroll. The vivid color and dramatic brush work of this talented husband – wife painting team allow the viewer to be a part of the scene reveling in the beauty and the light. 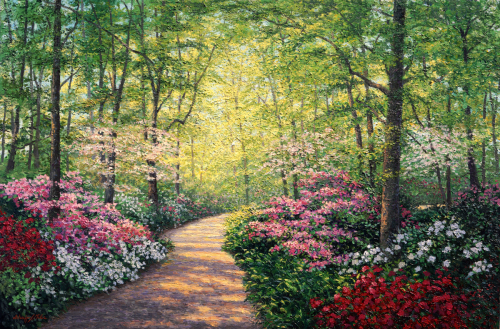 Created from the artists’ first visit to Callaway Gardens in Pine Mountain, Georgia in 1990, this romantic painting is a very popular image. This vintage print is now available from the beginning of the artists’ careers and sure to be a cherished collector’s piece in the future. Collect this image now with a special drawing unique to each print in the border. $125.00 includes a certificate of authenticity from the artists. $275.00 Beautiful enhanced canvas lithograph, embellished in lush oil paint by the artists.